So, food was to be used as just another method of imperial colonization to force countries to conform their policies to those desired by the controllers. Notably, this tactic only works as a blunt weapon on territories enduring a severe economic collapse and with little resources for food production. 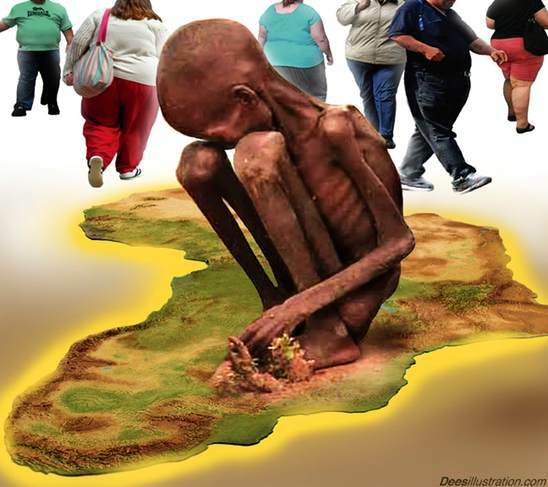 Today, however, it appears that the entire globe is receiving an arsenal of food bombs as there appears to be a multifaceted attack on people’s access to food. In other words, what has been an admitted tactic for nearly 40 years of controlling food aid for regional population reduction has now grown more complex and expansive. 2. False Shortages: Through supply controls, food shortages have been used as a weapon to create regional conflicts, to encourage peacekeeping missions, and as a foreign policy carrot — as clearly outlined in Kissinger’s 1974, Memorandum 200. The most recent examples can be found with the current and ongoing negotiations with North Korea who perpetually holds a nuclear gun to the West’s head in exchange for food. Somalia, who was food self-sufficient until the 1970s, has become a “failed state” because of food shortages. Significantly, the situation in Somalia and other large-scale famine are usually caused by a manipulated economic collapse. In fact, many have reported that the lack of food was an underlying factor of the Egyptian revolution. 4. Regulations: By restricting food freedom, regulatory agencies purposely increase dependence on the Big Ag monopoly cartel that fully controls the basic building blocks of food. Simply put, those who control the corn, wheat, soybeans and rice, control all food, since all livestock and all processed foods are dependent on those food sources. In America, and increasingly around the world, this cartel places their cronies in government regulatory agencies like the USDA to weed out their competition through excessive regulation. Furthermore, this restriction of food freedom is happening in concert across the globe, precisely because it is a top-down globalist initiative driven by international regulatory agencies such as the World Trade Organization and the United Nations. It is a complex, interwoven agenda that takes into account everything from health safety to land use rights in order to force independent food producers to conform in ways that only benefit a global corporate structure. Regulatory agencies are one of the primary weapons deployed against independent living. Offensive abilities could provide spoofing options to create virtual weather in the enemy’s sensory and information systems, making it more likely for them to make decisions producing results of our choosing rather than theirs. It would also allow for the capability to mask or disguise our weather-modification activities…. Also key to the feasibility of such a system is the ability to model the extremely complex nonlinear system of global weather in ways that can accurately predict the outcome of changes in the influencing variables…. This entry was posted in Biotechnology, Food Criminalization, Genetically Engineered Food, Geoengineering, Land Rights, Monopolies, Tribes and tagged depopulation, food adulteration, food control, food speculation, gmo, Gmos, land grab, spermicidal corn. Bookmark the permalink. Vote with your wallet. Start by not buying any “food” product that contains corn, soy, canola or cottonseed! Pingback: 6 WAYS FOOD IS BEING USED AS A WEAPON « Tulsa Change | The Time For Change Now! Growing our own food and insuring that right may be the last bastion of defense against Global Government.